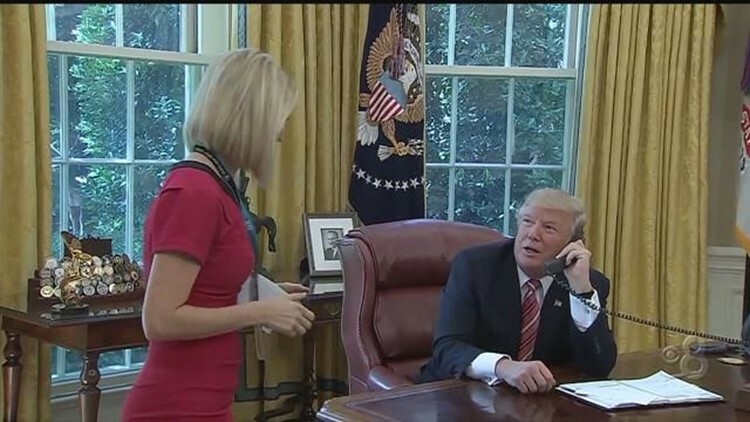 President Donald Trump interrupted a telephone conversation with Ireland's prime minister to compliment an Irish journalist on her "nice smile." WASHINGTON (AP) — President Donald Trump interrupted a telephone conversation with Ireland's prime minister to compliment an Irish journalist on her "nice smile." Caitriona Perry is a Washington correspondent and U.S. bureau chief for RTE News-Ireland. She was in the Oval Office with other journalists to document the Tuesday call. Trump was congratulating Leo Varadkar on becoming prime minister, and mentioned that Irish reporters were among those listening. Trump then pointed to Perry, called her over to his desk and asked where she was from. Perry identified herself, and then Trump told Varadkar: "She has a nice smile on her face so I bet she treats you well." Video of the encounter is making the rounds on social media. Perry also tweeted the video. She described the encounter as a "bizarre moment."